6.2 Earthquake hits the Prince Edward Islands. 5.9 Earthquake bits the Molucca Sea. 5.3 Earthquake hits the D’Entrecasteaux Islands. Three 5.2 Earthquakes hit the Babuyan Islands in the Philippines. 5.2 Earthquake hits the Nicobar Islands off India. 5.1 Earthquake hits the Flores Sea. Two 5.1 Earthquakes hit the Babuyan Islands in the Philippines. 5.1 Earthquake hits southeast of Easter Island. In the South Indian Ocean – Tropical cyclone Adjali is located approximately 279 nm southwest of Diego Garcia, and is tracking southeastward at 09 knots. Singapore – The monsoon season has seen heavy rain falling over many parts of Singapore in the past few weeks. Hougang and Macpherson were affected by flash floods on Monday. Florida, USA – A tornado touched down early Monday at a state prison near Blountstown in Florida’s Panhandle, slightly injuring two people. Scientists finally discovered the culprit responsible for wiping out starfish along the Pacific Coast: a killer virus called SSaDV. They can’t exactly figure out why it became deadly or if it will continue to kill a lot of other species, however. 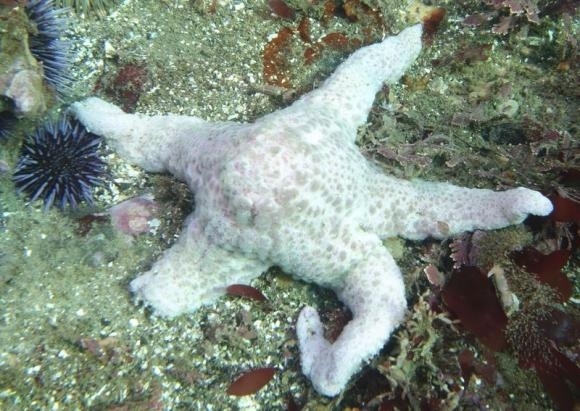 Researchers from University of California, Santa Cruz and Cornell University said the pathogen that causes starfish to wither and die was identified as “Sea Star Associated Densovirus (SSaDV),” a type of parvovirus found in invertebrates. SSaDV triggered the deadly epidemic among starfish because of its overpopulation caused either by a genetic mutation or other unknown environmental factors. The densovirus dissolves the starfish in under 10 days, leaving a pile of dissolved starfish. The infection over the past 18 months has affected a majority of the starfish population and stopped their reproduction. Aside from starfish, the disease is also present in brittle stars and sea urchins. Their presence was also discovered in seawater and sediments collected from affected areas, including Santa Cruz and Monterey. “There are 10 million viruses in a drop of seawater, so discovering the virus associated with a marine disease can be like looking for a needle in a haystack,” said Ian Hewson, a professor of microbiology at Cornell University, said in a statement. Fishermen are also affected because they aren’t able to catch crabs because their nets keep catching dissolved starfish. Scientists are now looking for ways to reduce the number of infections by sterilizing the starfish and treating them with UV light. This should help in removing the possibility of starfish becoming extinct. Bardarbunga (Iceland): Winter conditions continue to make it difficult to study the fissure eruption at Holuhraun. Rare opportunities for visual observation however revealed that the Baugur crater ceased to eject tall lava fountains and transformed into an elongated, boiling lava lake. Magma seems to be welling up in this lava lake at the same effusion rate as early November.